HDR (High dynamic range) is not new in smartphones. Galaxy S3 already had HDR mode. Most middle-range smartphones now have HDR. Normal cameras take photographs with a limited exposure range. This leads to the loss of detail in bright or dark areas. HDR compensates for such loss of detail by capturing multiple photographs at different exposure levels and combining them to produce a photograph representative of a broader tonal range. In other words, HDR is able to cope with overexposed and underexposed problem on an image. But what makes Galaxy S5 HDR (Rich tone) unique? In Galaxy S5 HDR (rich tone), Samsung implemented so-called “what you see is what you get” HDR processing. For other smartphones, to take a HDR photo, you have to hold the smartphone still for a long time until multiple (usually 3) photos with different exposure levels are taken. However, Galaxy S5 HDR gives you instant preview of the photo that will be taken in HDR, instead of showing you the dark or light preview. Because Galaxy S5 HDR photos are taken faster, it is not necessary to hold S5 still for long time to take a HDR photo. It is almost instant, probably partially due to the Galaxy S5 fast auto focus. Galaxy S5 HDR also produce better photo quality compared with other smartphones. Color is reproduced vividly and clearly. This is probably the reason why Samsung add rich tone and call it HDR (rich tone). Galaxy S5 HDR (Rich tone) is also available for video! 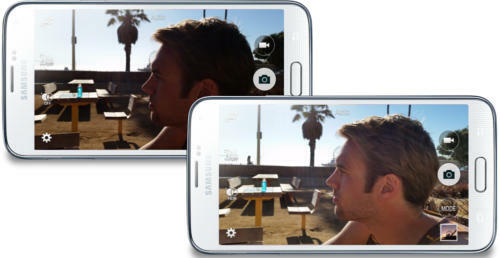 For the first time in smartphones, Galaxy S5 HDR is also available for taking videos. If you often shooting outdoor videos with smartphones, this is probably a long anticipated feature. When do I need Galaxy S5 HDR (Rich tone)? When there is a strong counterlight or when the subject is shaded, Galaxy S5 HDR (rich tone) mode can significantly improve the photo quality and gives you brighter and vivid captures. In normal conditions, you probably do not need it. Of course, Galaxy S5 camera has many other modes and options that help you get the best quality photos under different scenarios. HDR is just one of them. Are there any side effects of using Galaxy S5 HDR (Rich tone)? Galaxy S5 HDR may take slightly longer time to process the final photo, and may take slightly more battery. But such side effects are very marginal. The major side effect of Galaxy S5 HDR is that photos don’t always look better than regular ones for indoor occasions. Normally, for indoor photos or videos, you’d better turn off Galaxy S5 HDR. Anyway, Galaxy S5 HDR let’s you preview the final photo, and you can always compare the photos with or without HDR before taking photos. No other smartphones in the market can provide this feature at this time. Do you have any questions on using Galaxy S5 HDR (Rich tone)? Please let us know them in the comment box below. Hi, Is there anyway to change the S5 metering mode when HDR is active, or change the exposure during HDR mode ? I notice S5 default to Matrix. My previous Galaxy S4 default to Central Weighted in HDR mode. The problem is when I take photo with bright background with S5 , usually the front object is dark and sometime can’t even see the detail. Whereas with the same scene and lighting S4 always produce much brighter and more detail photo. Yes, S5 gives real time HDR and faster , but pointless if the output is poor. HDR mode in S5 seem to ‘darken’ the bright area but doesn’t ‘brighten’ the dark area much. Probably, you cannot change them once you enable HDR. You may try other camera apps to find whether there are such settings for you. Can I use the HDR image taken with my S5 for rendering HDRI in a 3D application? I don’t think they have any connections. HDR photo is just normal file without the additional channel. 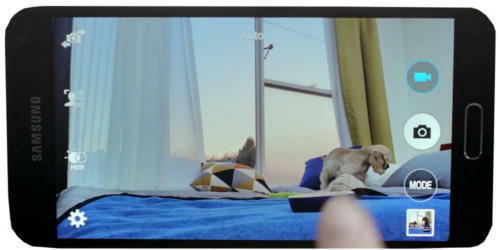 For HDR photos, the system will take 2 photos automatically, then combine them automatically. It should not ask you to take more than 1. How did you get the message?